The title is taken from ABBA’s catchy 1970’s disco song “Dancing Queen“, which also builds the acoustic background of this video. Acting in the video is a battery powered toy soldier, that originally was designed to crawl on the floor. From time to time the toy soldier interrupts it’s movements lays still and pretends to shoot before he continues to gain ground. For their video, Stefan + David simply changed the soldier’s position from its horizontal orientation into a vertical and adjusted the speed to the rhythm of the sound. In that new position the motion, which was designed as a militant gesture, transforms into a dancing move, a gesture of joy and absence of worry. 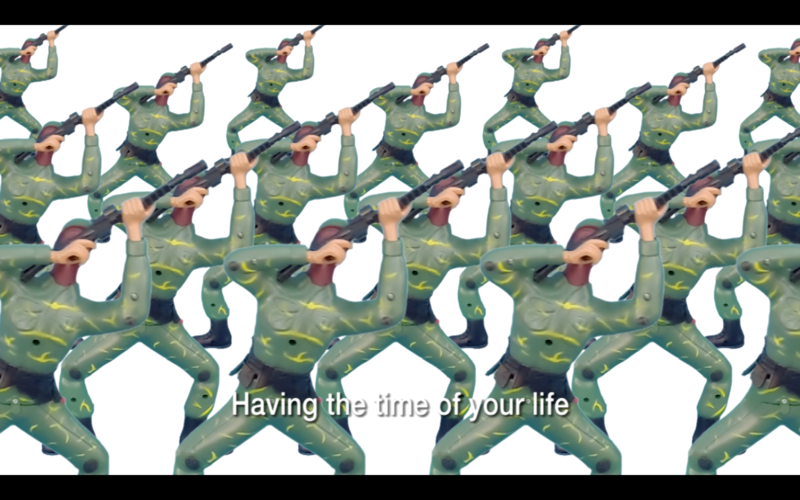 With their artwork “Dancing Queen“ Stefan and David offer a simple but significant shift of perspective and question the common practice of responding conflicts with militant violence.